Performance Magazine Online – 66 digitised issues, a new film and five new commissions. Between 1979-1992 Performance Magazine documented an extraordinary period in the development of art in the UK. With its maverick and punk ethos Performance Magazine embodied an immensely active community of artists, writers and publics that crossed disciplines throughout the late 70s, 80s and the start of the 90s. The magazine provided a vital platform for the awareness of new approaches to the making and experience of art by creating a critical context and space for discourse. Moving beyond Performance Art and conventional categorisations, Performance Magazine was instrumental in promoting cross-disciplinary and underground art and played an important role in triggering the development of Live Art as a terminology and field of creative practice. Rob La Frenais (founding editor 1979 – 1987) has collaborated with Live Art Development Agency (LADA) to develop this project – Performance Magazine Online. All sixty-six ISSUES of Performance Magazine have been digitised and are accessible on this site for you to freely search, browse and read. A new FILM by Hugo Glendinning and Alex Eisenberg maps the magazine’s history and legacy Commissioned FEATURES by Anne Bean, Hester Reeve, Lynn MacRitchie, Claire MacDonald and Nahum Mantra respond to the archive and the period when the magazine was published. Performance Magazine Online launched with two public events: in Hull on 25 March 2017, as part of the Re-ROOTed Festival and at the British Library in London on 27 April 2017. LADA also hosted a STUDY DAY and workshop with Something Other (Mary Paterson, Maddy Costa and Diana Damian) looking at Live Art, writing and digital publishing on 25 April 2017. To keep up to date about the project sign up to the LADA newsletter here and join the Performance Magazine Online Facebook page. This film by Hugo Glendinning and Alex Eisenberg brings together original editors, guest contributors and others connected to the magazine to reflect on it over 30 years on. View the full list of articles and issues. Artists and writers respond to Performance Magazine. We have taken our cue from the magazine itself and invited a series of new contributions in the form of FEATURES, specially commissioned for this project. These have been conceived both for live and online spaces and will be activated by the project launch events in Hull and London. They are intended to provide a series of personal pathways into the past issues of the magazine and to connect us to the era in which it was published. Claire MacDonald has shared a spoken letter to Steve Rogers and a written piece by Lynn MacRitchie surveys the history and context of Performance Magazine. Contributions also come from Anne Bean, who will present a video based on her performance in Hull. Hester Reeve and Nahum Mantra both present pieces drawn from their live works at the London launch event. 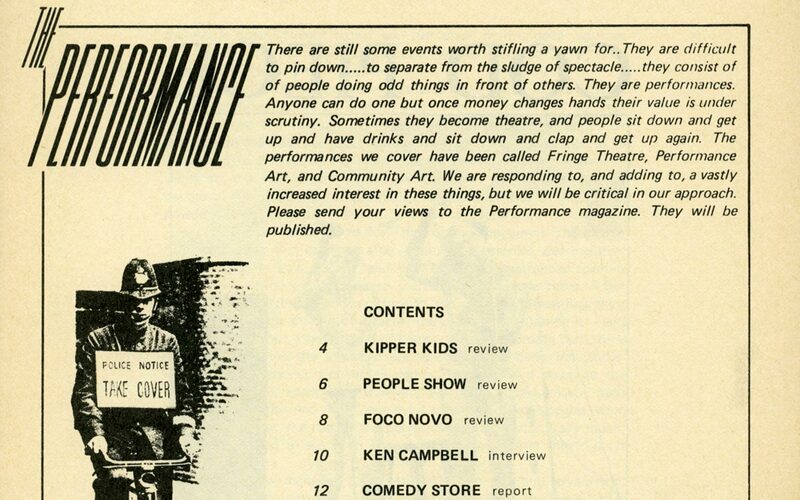 Diana Damian Martin has written an essay about the Performance Magazine Archive. Features will be released between April and July 2017. Sign up to be kept updated. Welcome to the end of a decade. Jupiter’s rings are revealed and a nudist beach opens in Brighton. Do you remember? An oil spill in the gulf of Mexico and John Paul II in Poland. Fire, isolation and dance. This is 1979. This film accompanied Nahum Mantra’s hypnosis performance Voyage: Experience 1979 which took place at the British Library as part of the launch of Performance Magazine Online in April 2017. Nahum Mantra is an artist, musician and curator that explores outer space and conjuring. Backwards Forwards is a video made by Anne Bean and Alex Eisenberg from the live performance Post Reality: Laws of Similarity and Contagion. The original performance was commissioned to launch ‘Performance Magazine Online’ at the ReROOTed Festival, Humber Street Gallery, Hull in March 2017. It featured live appearances by Rob La Frenais, Richard Wilson and Yol. This video work presented here accompanied ‘the rest of Hester’s body’ carrying out an action at the Performance Magazine Online launch at the British Library. Completely covered by a ghost outfit sewn from painting canvas, Hester silently inhabited the venue for the entire duration of the event. Sometimes she brushed past people as they chatted and drank or she stood still and unexpectedly dropped a large stone she was carrying under her costume on the floor, other times she continually span on the spot, off to one side. Overall, this two-part art work sought to connect and transmit all the bodies, memories, skills and commitment to live art that were in the room on the night of the launch whilst allowing the space of the ‘unthought’ (that which encompasses past, present and future tenses) a place within the throng of it all. Claire MacDonald was the guest editor of the 50th issue of Performance Magazine which was published in November 1988. Steve Rogers was the editor of Performance Magazine between 1987 and 1988 and a close friend of Claire. This is a spoken letter to Steve which Claire recorded in 2017. Lynn MacRitchie was closely associated with Performance Magazine from 1980 to 1985 as contributor, editor and director. In this short essay she surveys and reflects upon the history and context of the magazine. Something Other (Mary Paterson, Maddy Costa & Diana Damian Martin) organised ‘Reading and Writing the Performance Magazine Archive’, a workshop day as part of Performance Magazine Online. This short essay by Diana Damian Martin reflects on the workshop day and the Performance Magazine archive, thinking about the gestures it makes in our current political climate. A project by Rob La Frenais in collaboration with Live Art Development Agency, 2017. In partnership with Re-ROOTed, Hull City of Culture 2017 and The British Library, London. All of the back issues of Performance Magazine are being made freely available to view online as part of this project. This has been done with the permission of the surviving Editors of the magazine, Rob La Frenais and Gray Watson. The copyright for articles, other texts and photographs in the magazine remains with Performance Magazine and/or the original creators, in accordance with the original copyright of each issue. The project has been produced in collaboration with the Live Art Development Agency (LADA). If you have any queries about the copyright or the way that the issues have been reproduced please contact LADA.